BLK Burgrz (pronounced “black burgers”) is now open in Ladera Ranch. The casual South Orange County restaurant features contemporary American small plates and full menu items with an emphasis on burgers and sliders made with American Wagyu and Kobe-style beef, served tableside. The venue also features a full wine list, handcrafted cocktails and craft beer selections from local breweries. BLK Burgrz, Mercantile East Shopping Center, 27742 Antonio Pkwy, Ste 7, Ladera Ranch, CA 92694, 949-429-6666. Downtown Santa Ana’s ever burgeoning dining scene is slated to welcome El Mercado Modern Cuisine in Spring 2014. The restaurant is the brainchild of Danny Godinez, chef/owner of the popular and acclaimed dining venue Anepalco’s Café, and promises to feature contemporary takes on classic regional Mexican cuisine, along with a full bar serving up craft cocktails. Dinner nightly. El Mercado Modern Cuisine, 301 N. Spurgeon St., Santa Ana, CA 92701, No phone available. 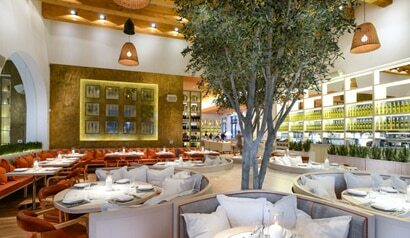 Fig & Olive, the Mediterranean restaurant with locations in New York and West Hollywood, opened a Fashion Island branch. It occupies its own structure with limestone stucco walls and olive trees. Executive chef Pascal Lorange's menu features shareable small plates (e.g. fig-Gorgonzola tartlet, zucchini carpaccio) and dinner entrées such as Provence rosemary grilled lamb chops served with goat cheese gnocchi and eggplant roasted with thyme and honey. The wine list focuses on varietals from the South of France, Italy and Spain. Fig & Olive, 401 Newport Center Dr., Newport Beach, CA 92660, 212-924-1200. Cathy Pavlos, owner and executive chef of Lucca Café in Irvine, will open a new culinary concept in Newport Beach called Provenance. The restaurant will take over the former location of Sage in the Eastbluff Village Center, which closed at the end of 2012. The new eatery will feature seasonal contemporary fare highlighted by ingredients cultivated from the venue's 1,300-square-foot, organic garden. Provenance, Eastbluff Village Center, 2531 Eastbluff Drive, Newport Beach, CA 92660, no phone. Reunion Kitchen + Drink is now open. The venue, which is located in Anaheim Hills in the spot Canyon once called home, is marked by an exhibition kitchen and a casual dining experience featuring a forward-thinking take on modern comfort food. Guests can also belly up to the bar and order from a selection of craft beers and era-spanning cocktails. For more information, visit www.reunionkitchen.net. Lunch and Dinner daily; Breakfast Sat.-Sun. Reunion Kitchen + Drink, 5775 E Santa Ana Canyon Rd., Anaheim Hills, CA 92807, 714-283-1062. Red O, the Los Angeles restaurant concept from Chicago celebrity chef Rick Bayless, launched a second location at Newport Beach's Fashion Island. The menu features Bayless' takes on classic Mexican cuisine, including original dishes exclusive to this outpost. Red O, Fashion Island, 143 Newport Center Dr., Newport Beach, CA 92660, 949-718-0300. The Annual Orange County Restaurant Week will descend upon all corners of OC February 23-March 1, 2014. Dozens of the county's top restaurants will be cobbling together special prix fixe, multi-course lunch and dinner menus, from casual venues to fine dining establishments. Some of the participating restaurants include The Ranch Restaurant & Saloon, Charlie Palmer at Bloomingdale's South Coast Plaza, Lucca Café, and Anaheim White House. For more information, please visit www.orangecountyrestaurantweek.com. Palm Terrace, Island Hotel Newport Beach’s flagship restaurant, is closing its doors for renovation starting in January 2014. The restaurant is slated to reopen in July 2014. Plans for alternative dining concepts during the renovation have not been formally announced. 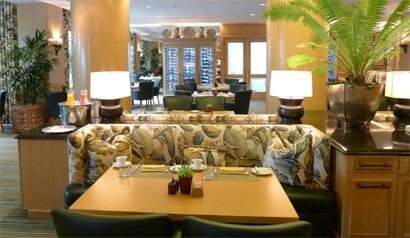 Palm Terrace, The Island Hotel Newport Beach, 690 Newport Center Dr., Newport Beach, CA 92660, 949-760-4920. DivBar Smokehouse BBQ, the roadhouse barbecue-themed venue located on Newport Beach’s Mariner’s Mile, has closed its doors. No reason was given for its shuttering, and no future plans for the space that housed the venue have been announced. DivBar Smokhouse BBQ, 2601 W. Coast Hwy., Newport Beach, CA 92663, no phone. The Californian, the flagship dining venue of the Hyatt Regency Huntington Beach Resort & Spa, has been temporarily closed for renovation. The eatery will be transformed to a new dining and bar concept, but it will be relaunched under the same name. The reopening is slated for Spring 2014. The hotel’s other dining venues will remain open during the renovations. The Californian, Hyatt Regency Huntington Beach Resort & Spa, 21500 Pacific Coast Hwy., Huntington Beach, CA 92648, no phone.